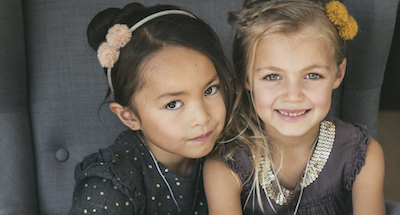 Luciole et Petit Pois is a new French brand making handmade hair accessories for children. Created by brother and sister Kristen and Karen, Luciole et Petit Pois offers a range of colorful hair clips and headbands. Inspired by Karen's four children and their many travels around the world, Karen and Kristen favor mixing colors and styles. We love their creativity and attention to detail!